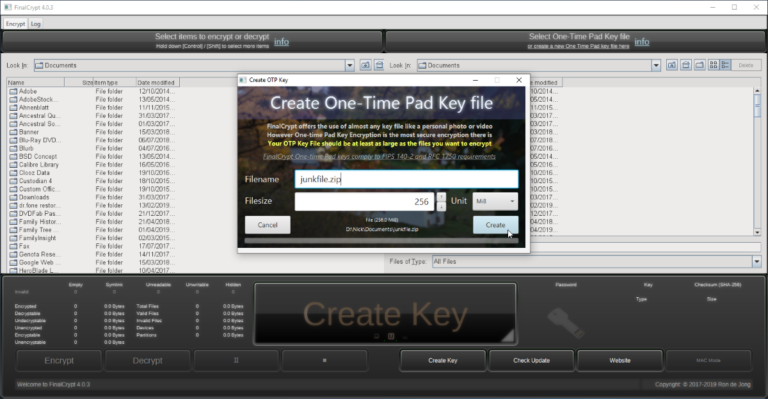 FinalCrypt is an open-source, cross-platform file encryption platform with two trump cards up its sleeve. The first is its use of Symmetric OTP encryption, of course, while it’s also been designed for bulk file encryption purposes, supporting up to four billion files and directories in one go for encryption and decryption purposes. The app sports a two-paned window -- on the right you select an existing file for your key file, or click 'Create Key' to create a random file from scratch -- its default size 256 MB, but you can increase it to terabytes in size if you so wish. A more logical choice would be around 8-16 GB -- large enough to fit on a cheap USB key, ensuring the key file can be transported wherever it’s needed to decrypt files, plus kept locked away in a safe place when not required. Be sure to take advantage of the 'Password (set)' option, which adds a secondary layer of encryption to ensure possession of the key file isn’t enough on its own to unlock the files. Once created, use the left-hand pane to select files or folders to encrypt before clicking Encrypt. Wait while the files are encrypted using your key file -- these are allocated a .bit file extension and the original, unencrypted files are securely shredded from your PC or Mac. Decrypting them later is simply a case of relaunching FinalEncrypt, selecting your key file plus -- if you set one -- the password, then re-selecting the encrypted files or folders before clicking Decrypt. It’s all relatively straightforward, but a bit awkward -- there’s no way to work seamlessly on the files while they’re encrypted. Nevertheless, combine Symmetric OTP encryption with a password-protected key file stored securely and FinalCrypt’s level of security beats other free solutions hands down. Version 4.0 was a recent major release, adding Star Trek-like sound effects and voice guidance to help aid users in navigating the program. FinalCrypt is available now as a free open-source download for Windows, Mac and Linux. Although coded in Java, a portable version of Java RE is supplied, ensuring no additional installation is necessary.